Above: A portrait of Kenneth MacDonald from the serial The Valley of Vanishing Men (Columbia, 1942). Deep-voiced, with a tough but intelligent face and a quietly authoritative manner, frequent screen villain Kenneth MacDonald was so intimidatingly competent that he could make his bad guys seem threatening without even raising his voice. MacDonald, whose screen career spanned five decades, specialized in playing calmly confident menaces in a wide variety of matinee fare, including several serials. In his cliffhangers, as in his other films, MacDonald could deceive heroes and manipulate henchmen with supreme assurance; his villains always seemed to stay a step ahead of the other characters until the final chapter. Kenneth MacDonald was born Kenneth Dollins in Portland, Indiana. He embarked on a show-business career shortly after leaving school, appearing in stage productions in the early 1920s (it seems he adopted his screen name around this time). He broke into motion pictures in 1923, through the attention-getting device of distributing a pamphlet called “The Case for Kenneth MacDonald” to multiple movie studios. MacDonald’s first before-the-camera role was in the silent comedy Slow as Lightning, in which he played the hero. MacDonald had been a star athlete in high school, and the picture drew heavily on his athletic prowess in several Harold-Lloyd-like sequences. Lightning set the mold for most of MacDonald’s other silent films, and he would play the lead in both action-filled comedies (After a Million, Dynamite Dan) and straightforward adventure films (The Coast Patrol, The Law of the Snow Country). When sound arrived in Hollywood, MacDonald’s smooth voice ensured the continuance of his career but deprived him of leading roles; his polished delivery was deemed unsuited to the energetic and often hapless heroes he had played in the silent days. MacDonald was reduced to bit roles in major and minor films for the first half of the 1930s, often playing background military figures, but he found a new niche in 1935 when he played the slick villain in the Reb Russell B-Western Border Vengeance (Willis Kent Productions, 1935). The same year, MacDonald, not realizing that he had created a new screen image for himself, apparently returned to stage acting for a while. He didn’t reappear in Hollywood until the late 1930s; one of his first roles upon his return was the part of another urbane heavy in a Charles Starrett B- western, Spoilers of the Range (Columbia, 1939). MacDonald quickly became a mainstay at Columbia; 1939 also saw him cast in two of the studio’s movie serials. 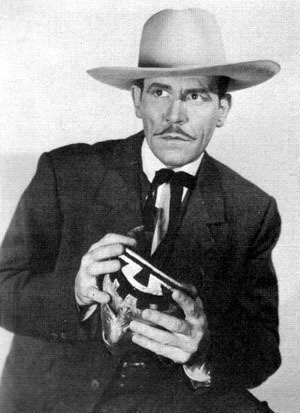 The first of these was Overland With Kit Carson, in which he played a suave gambler named Winchester, one of many characters suspected of being the mysterious outlaw boss “Pegleg.” MacDonald proved to be a good guy in the end, however, and played a similar role in his second Columbia serial later that year. Mandrake the Magician featured MacDonald as James Webster, an engineer friend of the titular hero (Warren Hull). 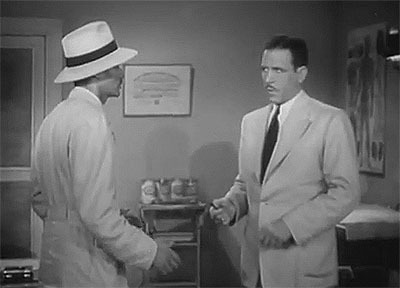 Webster aided Mandrake in his fight against a master criminal called the Wasp, but was strongly suspected of being the Wasp himself until the final chapter, when MacDonald’s character was again cleared of all wrongdoing. Both serials was well-done, and MacDonald’s smoothness of manner suited him perfectly for his “red herring” parts. His role in Mandrake was more substantial than his role in Carson, in which he was one of half-a-dozen suspects; in Mandrake he had only two competitors in the suspect sweepstakes, and got to assist the hero in several action scenes throughout the serial. 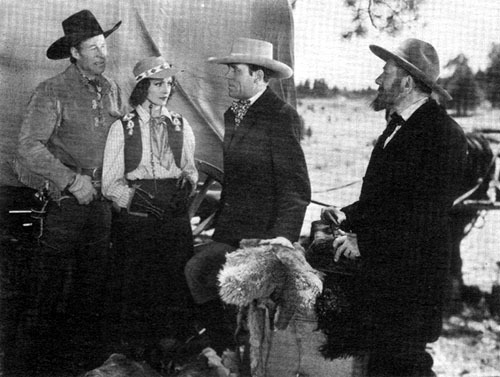 Above, from left to right: Bill Elliott, Iris Meredith, Kenneth MacDonald, and Francis Sayles in Overland With Kit Carson (Columbia, 1939). Above: Kenneth MacDonald (with an uncharacteristic smile) and Warren Hull in Mandrake the Magician (Columbia, 1939). MacDonald would spend the first half of the 1940s working almost exclusively at Columbia, only occasionally appearing at other studios like Republic and Monogram. He appeared in innumerable Charles Starrett and Bill Elliott B-westerns (invariably as the villain) and many of the studio’s B-mysteries and horror films (as heavies or occasional doctors and policemen). 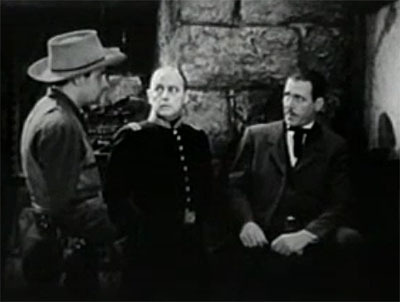 During these busy years, MacDonald also found time to appear in Columbia’s serials; the first of his 1940s cliffhangers was Perils of the Royal Mounted (Columbia, 1942). This Mountie chapterplay featured MacDonald as Mort Ransome, a fur trader determined to maintain a business monopoly by keeping settlers out of the northern woods. Ransome did his best to incite an Indian rebellion in pursuit of his goals, but his plans were thwarted by RCMP Sergeant MacLane (Robert Kellard). Royal Mounted was a very uneven serial, thanks to comedic elements inserted by director James Horne and some outrageous overacting by the cast. However, while hero Kellard bellowed most of his lines and supporting players like Charles King and Nick Thompson engaged in cartoonish shenanigans, MacDonald stole the serial by underplaying his role. His sly, dryly sarcastic performance as the supposedly respectable Ransome was a welcome counterpoint to the wild antics of the rest of the cast. Above: Kenneth MacDonald plots with shady Indian medicine-man Nick Thompson in Perils of the Royal Mounted (Columbia, 1942). Also in 1942, MacDonald appeared in a second Columbia serial, the Western cliffhanger The Valley of Vanishing Men. He played Jonathan Kincaid, a smooth outlaw who staffed a secret gold mine by kidnapping and enslaving various victims; he was also using his mine to finance a scheme for conquering Mexico. Hero Bill Elliott, a former Confederate officer, smashed this setup and rescued his father, the imprisoned rightful owner of MacDonald’s mine. Vanishing Men had its flaws, but was much more exciting than MacDonald’s previous serial Perils of the Royal Mounted. MacDonald’s role gave him plenty of opportunities to be smart and coldly ruthless–particularly when calmly gunning down unsuccessful henchmen in cold blood–but since his character was known to be a villain by the whole cast from Chapter One, he didn’t get to indulge in the two-faced behavior that he made so memorable in his other turns as serial brains heavies. 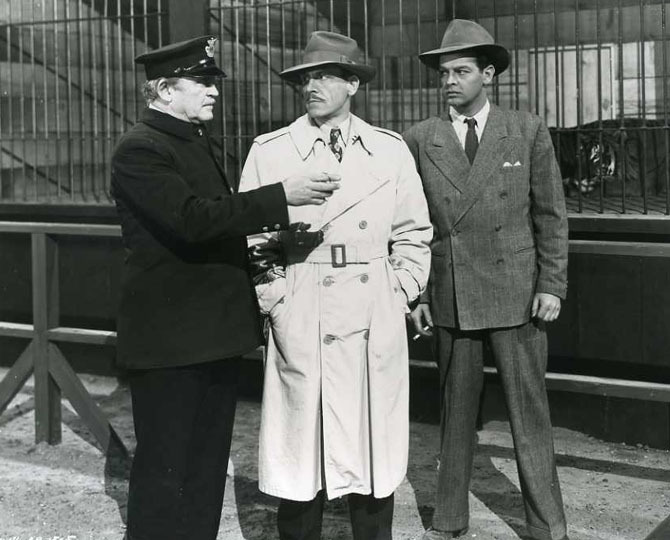 Above, from left to right: John Shay, Arno Frey, and Kenneth MacDonald in The Valley of Vanishing Men (Columbia, 1942). Above: Kenneth MacDonald surprises Carmen Morales in a publicity still for Valley of Vanishing Men. MacDonald’s next serial, The Phantom (Columbia, 1943), was an excellent jungle adventure based on a popular comic strip. This time, MacDonald was cast as Dr. Max Bremmer, ostensibly a kindly jungle physician but actually a foreign agent planning to build a secret air base in the lost city of Zoloz. Bremmer had the mysterious jungle ruler known as “the Phantom” killed in order to further his scheme, not knowing that the Phantom title had passed from father to son for generations. 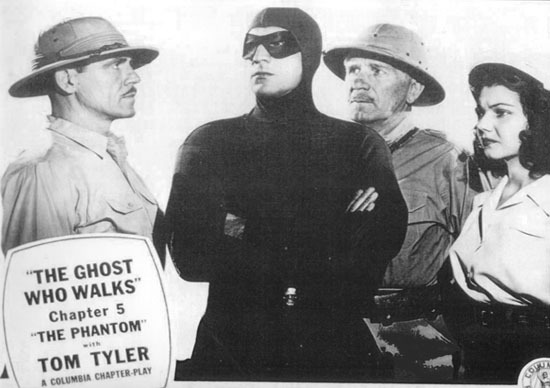 The new Phantom (Tom Tyler) quickly took up his father’s mantle, and defeated Bremmer’s attempts to keep an archeological expedition from reaching Zoloz and discovering the air base. However, Bremmer managed to hide his own culpability from both the expedition and the Phantom until the very end of the serial. MacDonald was at his calmly sinister best in Phantom, whether he was smoothly spinning lies for the good guys’ benefit, sardonically questioning his henchmen’s continual false reports of the Phantom’s death, or grimly and deliberately preparing to knife a terrified accomplice to death. Above: Kenneth MacDonald threatens Paul Marion in The Phantom (Columbia, 1943). Above: Tom Tyler, as the masked Phantom, confronts Kenneth MacDonald in a publicity image from The Phantom (Columbia, 1943). Frank Shannon and Jeanne Bates are behind Tyler. The Phantom was followed on Columbia’s serial release schedule by 1944’s The Desert Hawk, another of the studio’s best cliffhangers. 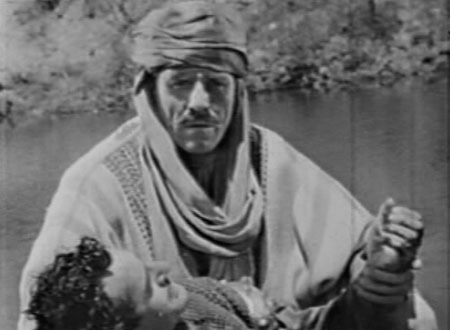 In this Arabian Nights adventure, MacDonald departed from his usual slicker roles to play the hard-bitten Akbar, captain of the palace guards in the Kingdom of Ahad. In the first chapter, the rightful ruler of Ahad, Kasim (Gilbert Roland) was secretly deposed by his evil twin brother Hassan, who then posed as Kasim in order to rule in his place. Kasim assumed the guise of a legendary bandit called the Desert Hawk to oppose his tyrannical brother, but was in constant danger from his own soldiers, who were unaware of his true identity. MacDonald’s Akbar served as Hassan’s main henchman for most of the serial and continually tried to kill the Hawk, but when he discovered that the “bandit” was actually his sovereign, he helped Kasim to regain his throne–and plunged a dagger into Hassan’s heart in the final battle. MacDonald made his character harsh and grim enough to be menacing, but also gave him a touch of upright military dignity that made his move to the hero’s side perfectly credible. 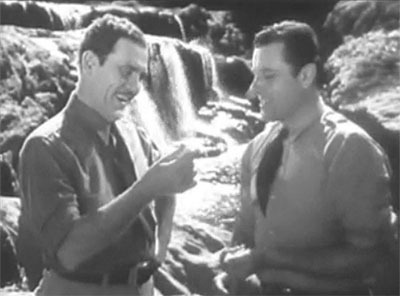 Above: Kenneth MacDonald discovers that Gilbert Roland (who he has just saved from drowning) is his rightful ruler in The Desert Hawk (Columbia, 1944). MacDonald returned to more familiar Western territory (and to the lead villain slot) in his next serial, Black Arrow (Columbia, 1944). He played Jake Jackson, a manipulative ex-carpetbagger who planned to gain control of a hidden gold mine within a Navajo reservation by precipitating an Indian war that would end in the Navajos being driven from their territory. Jackson murdered the peaceable Navajo chief as part of his scheme, but the chief’s son Black Arrow (Robert Scott) refused to blindly retaliate, and despite the hostility of the local settlers and his own tribe, succeeded in exposing Jackson’s machinations. Though Black Arrow was not as strong as MacDonald’s previous two serials, it was still a very well-made chapterplay, and MacDonald was definitely in his element as the outrageously mendacious Jackson–who managed to convince townspeople, Indians, and outlaws alike of his trustworthiness while using them all as expendable pawns, coolly letting them die (or just as coolly killing them himself) when it suited his ends. Above: Kenneth MacDonald (second from right) engages in some scheming in this lobby card for Black Arrow (Columbia, 1944). 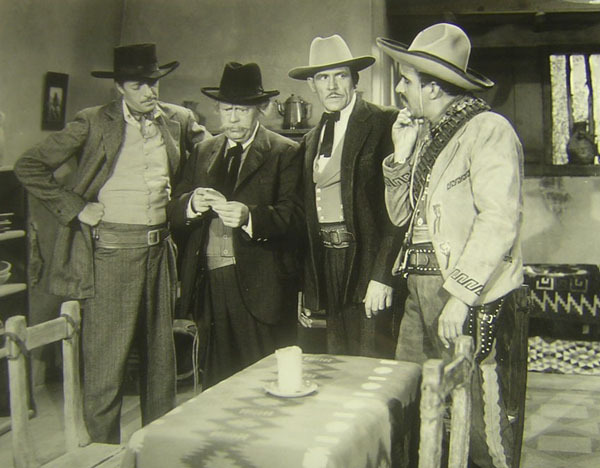 Bud Osborne is second from left. 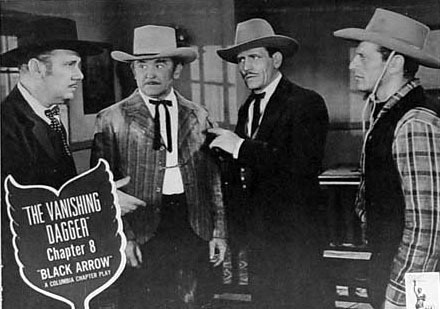 Above, from left to right: I. Stanford Jolley, Ferris Taylor, Kenneth MacDonald, and Martin Garralaga in Black Arrow. MacDonald’s final 1940s Columbia serial was 1945’s The Monster and the Ape, in which he played a small role as Police Inspector Hamilton, appearing once every five or six chapters to help hero Robert Lowery track down a mad scientist and recover a stolen robot. Shortly after Ape’s release, Columbia disbanded their B-western and serial production units and set up new production arrangements with Sam Katzman (serials) and Colbert Clark (B-westerns). The new Columbia producers brought their own acting stock companies with them, and MacDonald found himself working chiefly at other studios from 1945 on–with one big exception. Beginning in 1946, he became a perennial heavy in Columbia’s Three Stooges shorts, and continued to regularly menace the team until the mid-1950s; his unshakably serious manner made him a perfect foil for the wacky comedians. Above: Zookeeper Bud Osborne directs Kenneth MacDonald and Robert Lowery to the gorilla cage in The Monster and the Ape (Columbia, 1945). Outside of his Stooge shorts, MacDonald began to move away from heavy characterizations as the 1940s wore on. He played small parts in major features like Brute Force and larger roles in B-westerns like Storm Over Wyoming, and was most typically cast as policemen, military officers, sheriffs, and other respectable types. He still played a few gamblers and shady lawyers during this period, but as he aged his dignity began to overshadow his sinister slickness. MacDonald continued playing largely respectable roles in the 1950s, and became a familiar face on television, appearing in The Gene Autry Show, The Adventures of Kit Carson, Ramar of the Jungle, and countless other series. In 1956, MacDonald returned to serial-making, playing the heavy in the Northwestern adventure Perils of the Wilderness (Columbia, 1956). The second-to-the-last movie serial ever made, Perils was an extremely low-budgeted endeavor built largely around stock footage from MacDonald’s 1942 serial Perils of the Royal Mounted; MacDonald’s character, as in Royal Mounted, was an outlaw leader–this time named Ben Roder, alias Bart Randall. MacDonald spent almost all of his time in the new footage discussing strategies with his henchmen, and didn’t interact with the good guys except in a couple of brief last-chapter scenes; he handled some of his lines with his accustomed smugness and suavity, but overall seemed a bit tired and bored, coming off as far less invested in this last role than in any of his other serial parts. 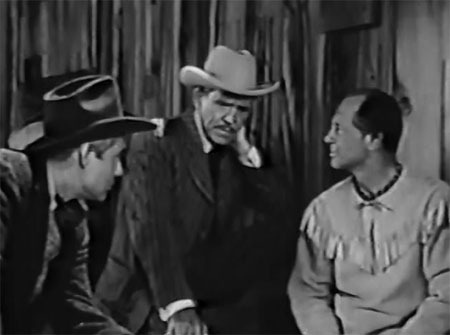 Above, left to right: Don C. Harvey, Kenneth MacDonald, and Terry Frost in Perils of the Wilderness (Columbia, 1956). 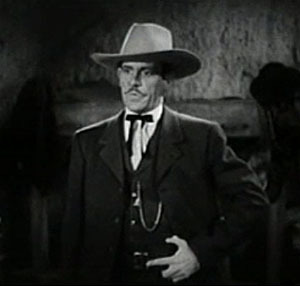 In 1957, MacDonald landed a recurring role on the short-lived Warner Brothers TV western Colt 45, as star Wayde Preston’s law-enforcement superior Colonel Parker. He also found a TV niche as a recurring judge on the Perry Mason show, presiding over Mason’s trials in more than thirty episodes from 1957 to 1966. He continued to appear in other television shows and play character parts in features throughout the fifties and into the sixties; his final feature film was the 1967 Audie Murphy Western Forty Guns to Apache Pass, in which he played the leading lady’s father. After a few more television appearances, MacDonald retired in 1970; he passed away two years later in Woodland Hills, California. Kenneth MacDonald almost invariably made his villains seem like the shrewdest and most intelligent character in sight, whether in B-westerns or serials. The absolute assurance with which he dismissed setbacks, the calmness with which he outlined new plans, and the smoothness with which he hoodwinked everyone around him, all combined to make his villainous characters as memorable, menacing, and Machiavellian as possible. Above: Kenneth MacDonald, looking slick in The Valley of Vanishing Men (Columbia, 1942). Acknowledgements: My thanks for much of the above information to the Old Corral’s page on Kenneth MacDonald.